I cannot think of a better way to commorate the day than a GIVEAWAY! 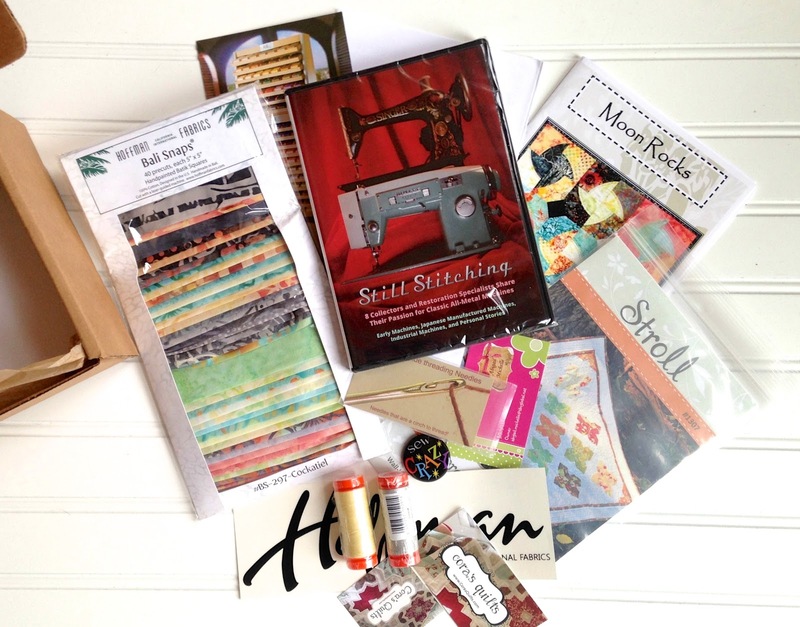 This is a sponsored giveaway from Quilter's Stash Box and includes a DVD for the amazing documentary Still Stitching! Quilters Stash Box offers a "Try Me" sized box option is half the size of the standard box and is still FILLED with incredible goodies! Make sure to visit Quilter's Stash Box to find out all of the options available and find one that works best for you! If you have not seen Still Stitching, there are numerous trailers available to find out all about this interesting and fun documentary. I enjoyed watching this trailer about the lovely Singer Featherweight! "One of the most pervasive and critical machines to enhance and advance civilization is the sewing machine, yet it is so easy to take for granted. Look around your home and identify all the items that required machine stitching to produce, and try to imagine life without the sewing machine." The giveaway will close on 25 March and a random winner will be chosen through Rafflecopter and announced on or about 27 March and I will contact the winner through email. I hope everyone enjoys this special day to celebrate and please SHARE this giveaway on all of your social media to give everyone a chance to WIN! HAPPY NATIONAL QUILTING DAY! Thank you SO MUCH to Quilter's Stash Box and Still Stitching for this FABULOUS opportunity! I would love to win but how? That's the question. Agree. Would love opportunity to win but no place to sign up. Thanks. This is an amazing giveaway. Thanks so much. I don't have a vintage machine yet. Still looking for a nice feather weight. Hi Kim. Yes, I own a vintage treadle machine. I don't know the year, but the brand is Minnesota, which was made for and sold by Sears Roebuck. Just 2 weeks ago my dad, with the help of YouTube, helped me put a belt on it, get it oiled up, and in good working condition. My mom helped me learn to use it. I still need a lot of practice before I attempt to make a project on it. Unfortunately I have no vintage machine but I would love to. Thanks for the chance! I have two vintage machines: A beautiful Singer 66 and a 1970's era Kenmore 158-1040 (the cute one with the fold out sewing deck and accessory box!) I don't sew on them, just admire them. No...but look at our salvation army atore...until I do! I have 2 treadles, one was my Husband's grandmothers, it is a New Royal, don't know the year of it. My Grandmothers, that I learned to sew on, is a Damascus Grand, purchased from Montgomery Ward in 1918 and it still works. I own a 50 year old Pfaff. It is all metal and very heavy, and it does the best FMQ if all my machines! I have a 1922 Singer. I do 99% of my quilting on my 1920s Red Eye Singer Treadle machine. I love that there isn't much that can go wrong!! I love all my Vintage Machines...I have 2 Singer Featherwieghts (1941, 1945), a Kenmore (1962/63) and a Sew Handy :-)Happy Quilting Day! I have a 1947 Featherweight. My grandmothers featherweight is waiting for me at my Moms house. I'm on the other side of the country so there are transport issues. I own my Grandmother's 'Good Home' or something like that, sewing machine, sadly no book. I can't get the tension to behave to sew a basic stitch. At least it has a pretty table cabinet that I use as a table. I have a 1946 Singer Featherweight and a "70s" avocado green Kenmore zigzag machine. Both of them work. I don't own a vintage machine, but would love to in the future. HELLO,no I do not! Thank You for sharing! No I do not onw a vintage machine, but my mother-in-law has one, and she's beautiful! I have several vintage machines, a couple of Singers - an old treadle and a 1940 or 50's? cabinet model, a pink Brother from the 1970's, and another treadle that I forget what make it is. Would love to win! I have a Universal Rotary vintage machine that was my Grandma's. I have two old probably 70's vintage sewing machines (does that count?!) One's a Singer Scholastic. It has great green highlights on it. The other one I just got and you load the thread on it's side. I'm not sure what the model is. Unfortunately I don't but I would love to! Happy National Quilting day! Box looks fun! I have my mother's Singer which is definitely vintage, probably from the 50's. I own a Janome and a Bernina. This is such an awesome stash box! This looks like a fabulous prize package. I would love to win it. I own two vintage Singers, a 221 and a 15-91. I love them both. My first machine was my grandmothers 50's White Rotary in a cabinet with a knee bar. My second was my other grandmothers 73 Kenmoore. My third was my 56 Singer Featherwieght, and then I have a Singer 185j, a couple of 50s Japanese clones, a SInger I turned into a handcrank. I also have a three newer machines. I think thats all? I have a treadle, a couple of older prior 60's, and 3 more plus a serger, and more UFOs than I can shake a stick at! I m a new quilter & I would love to win!! I have a Singer 301 that sews like a dream. I do not have a 'vintage' machine. My first machine was a Home sewing machine that I received from my then fiance in 1969. It was my only machine for a long time. During an inter-state move, it was unfortunately, inappropriately stored. It has rusted and the case has all but fallen apart. In 2010 I bought a Huskvarna Viking Saphire. I love it. I own a Singer Featherweight! I love it! I have a vintage White machine...white is the brand, turquoise is the color. I only wish I had a vintage sewing machine, but I do love my Pfaff Quilt Expression 3.0!! Yes, I still have the Featherweight I received for Christmas when I was 13. It is definitely an antique now.thsnks. I own a Singer 301A and a 1923 Singer 66 Redeye ... both great machines!! I have a featherweight I bought last April. I haven't used it yet though! Kind of nervous about it. I would love to own an old treddle machine. I remember my grandma and my godmother both having one and I was fascinated by them. I wish I had one or both of them now. My Mum also had an old Singer in a wooden box. I'm not sure why because I don't recall her ever sewing. I did own a Singer 99K but had to sell it for medical bills. One of these days I'll have another one. Until then I'll use my Bernina 1260. Could be considered vintage at 20+ years old? I know you didn't ask but my bucket list of machines includes a Juki TL-2010Q for a new machine, my Bernina 1260 and another Singer 99K. Once I achieve having those machines I'll be in 7th heaven. What a great way to celebrate International Quilting Day. I hope you found time to enjoy and create today. I have two Brother Machines. The PQ1500S and the CS-6000i. I totally love how there is a National Quilting Day ... perhaps it should be an international day to spread the warmth! I own a vintage Kenmore portable machine that I use as a back up and for classes. It is from the 70's so I don't know if it actually counts as vintage, though! I can't remember the model number, but they sometimes refer to it as the Kenmore :featherweight." Happy National Quilting Day! I learnt to sew on my late mom's Singer. I still have my grandmother's treadle Singer machine, but unfortunately I couldn't bring it with me when I moved abroad, it's at a dear friend's place. I have a nice Singer featherweight machine. Works like a charm and the stitches are beautiful. I don't own a vintage machine but my machine is 25 years old so its getting there! My machine from 1970 is not quite vintage, yet. Here in Katy, TX, we are lucky to have a wonderful shop that sells vintage sewing machines. I would love to have one of their treadle machines. They are so beautiful. I have a 1950s Singer that was my mom's - it's in a cabinet and is a workhorse. I don't own a vintage machine but I love how quiet the featherweights are. I have my mother's avocado green Viking. It sews like a dream! 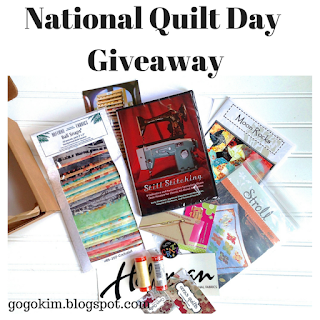 Thanks for the awesome giveaway, and Happy Quilting Day! I have several vintage machines. I have a featherweight but I also have a treadle and the sewing machine my mom bought when I was 10 and learning to sew in 4-H. I would love to see the video. no vintage sewing machine for me, i just don't have the space. i do have an antique spinning wheel, does it count? Oh what a wonderful giveaway to celebrate an awesome day! Happy quilting day! I don't own a vintage machine, but I would love to get a treadle machine or featherweight. I'm waiting to discover in a yard sale that little block box that the seller doesn't understand what they have and just want to get rid of it. I know, I'm dreaming. The giveaway looks like fun. I've been thinking of signing up for the box. I have a Singer Featherweight. I really love the older machines. Having a machine that weighs so little is great with my small apartment. I can set up and take down whenever I need to. We have my husband's grandmother's 3/4 Kenmore. I had it serviced so I could use it but I could never get the hang of it (tension problems neither of us could solve). I have my Grandmother's Singer sewing machine which I love. Thanks for the fun giveaway!!! I have my hubby's grandmothers singer. I don't have a vintage machine, but I have considered getting one. I just don't know where I would get it serviced. Of my 5 machines, one is a Singer from the 50's. Sews like a dream! I do own a Featherweight machine. It's so cute and green and in a green box as well! I also have a Singer in a rounded wooden box. I really haven't used that one ~ I bought it because it was so cheap and need to sell it again. Both are in good condition and work like a dream! I have 2 vintage sewing machines, one is a Singer the other a Kenmore. I haven't used either of them yet, but they both seem to work. I don't have a vintage machine. No vintage machine, 2 Berninas and a lightweight Babylock for travel! Sorry for clicking the reply button without actually answering your question! I do not own a vintage machine, but would love to! Thanks for the chance to win. My oldest machine is from the 80's. I don't know if that counts as vintage. I would love to get a featherweight from the year I was born. So excited to be finding another quilt/sewing blog! Waste a lot of time I could be sewing by reading blogs! Love my vintage singer featherweight, singer 99, and singer 301A. Have pieced quilts on all of them. No vintage machines for me. HOwever, I have sewn on borrowed featherweights at others' homes or retreats. These old featherweights really are things of beauty. Thank you for the opportunity for cool stuff. I have a Singer Rocket-propelled and a vintage Kenmore. Both have sew like a dream! I own a Singer Featherweight 221. A fun little machine. I have a Singer treadle, featherweight & 301. I also have a Morse which is a machine made in Japan after the war. It is a lovely teal green and sews beautifully. No vintage machine in my life unless a 25 year old Bernina is now in that category. Three Bernina machines are available to me and I use one exclusively for embroidery. Thanks for the introduction to the Quilting box. Thanks for a chance in the giveaway. I enjoy reading our blog. Thanks for the chance to win some great stuff. I own an old Singer 401g, it's older than me but I love the old girl! No I don't have a vintage machine-just a small, basic modern model. I don't have a vintage machine. Me grandma did! My Bernina is turning 20 this year, and I've had her for her whole life! Still going strong. My husband bought a 1917 Singer portable and has become quite interested in vintage sewing machines. Would love to win this DVDs. Thank you. I used to have a vintage Singer of my mother's, but I had to sell it when I was dead broke....8-( I would love to have a Featherweight, and will snap it up if I ever find one!! My husband surprised me for Christmas and bought me a Singer Featherweight from 1951....best gift ever! Both of my grandmothers had vintage singers that I can remember. But not me unfortunately. Yes I have several vintage machines ,Singer 15/91 , 301 and a feather weight plus other vintage machines I don't actually use but have on display. Thanks for this chance I would sure love to win . No I don't own a vintage machine now but many years ago I had an old treadle machine that was my great aunt's sewing machine. I don´t have a vintage machine though could call my machine vintage because is 19 years old.Thanks for the fun. I don't have any vintage machines. I don't need to start collecting any more sewing stuff! I have a sweet little 1948 featherweight. very glad to have her. she is a bit scratched ~ not perfect ~ but works beautifully. would love love love to win your wonderful giveaway. do follow your blog. thank you. I have a vintage Singer from my mother. It was given to her in 1966 when she and my dad were deployed to Turkey. She made all my baby clothes on it. I do not own a vintage machine - yet. I think my Mom had an old machine, but I'm not sure where it is now. I hope to one day find a featherweight. It would be a dream come true. I don't have any, but my mom has a few Featherweights in her collection! Lots of goodies to be had! I hear a lot about featherweights but not fortunate enough to own one...maybe someday? Got a little bit of stitching in today but Monday's are my sew day!Happy Quilters Day! I don't own any vintage machines. someday, maybe. Thanks for the chance to win!! Hiya!!! Yes, I have a vintage machine, one so obscure that I don't know how to operate it and can't find out anything about it on the Internet. It has a brand name of "Modern" on it, but I can't locate anything about it anywhere---yet!!! I'm not giving up on finding out about it, just need more research. Thanks for having the giveaway. Blessed be, hugs!!! I love and use my vintage machines. I have a Minnesota treadle in a refurbished parlor cabinet, a 1930s Singer 66 Red Eye that needs a new treadle cabinet, a 15-88 that will be going in the cabinet I used when I was a kid, and a 15-91 in a refurbished trapezoid cabinet, plus a Free Westinghouse and a Featherweight. I've seen snips of the movie, and really want to see the whole thing. Thanks! I know they aren't very desarible,but I love mine. I have a White Rottary series 43. It's a very heavy machine. I learned to sew on my moms old black Singer. I have no idea of the model but my sister has it now and makes her grand daughters Halloween costumes and some dresses. I need to check out exactly what model it is, it sews better than the one I currently own! I only have new machines. I wish I could have had my grandma's machine, though! I don't own any vintage machines, just a Brother. I do not own a vintage sewing machine. I would love to own a working treadle machine someday though! What a generous giveaway!! Happy Quilting! I have a 301, a Singer clone, and a 503. 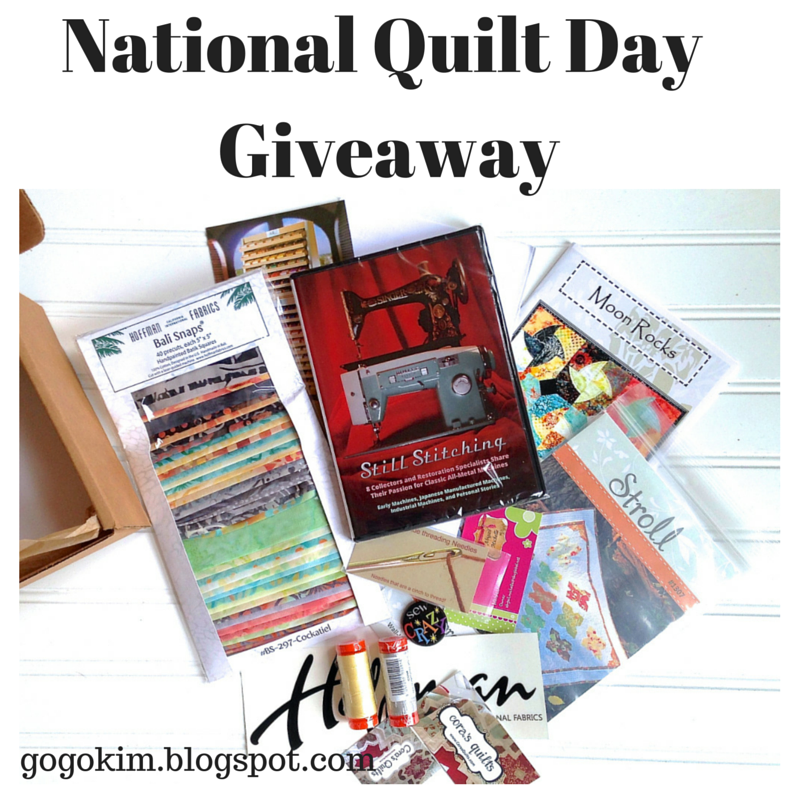 Thanks for the chance to win the box of quilting goodies! Waiting to inherit the vintage Singer from my parents who inherited it and the cabinet it came in from my great aunt who had a laundry and alterations business with her husband. My mom doesn't sew on it - she just likes the look of the cabinet! The only vintage machine I own is a Dressmaker. It belonged to a neighbor. I found an old Singer on the side of the rode next to the trash, still in the table. I grabbed it, brought it home and to my surprise it still works!!! I have a Featherweight, a Paragon treadle, and a Vesta sewing machine. Love the old ones! Thanks for the giveaway! I do not own a vintage machine, but someday hope to inherit my great-grandmother's treadle. Thanks for the chance to win! Thanks for the giveaway! I have a 1956 Featherweight! I started with a Featherweight about a year ago and now have a 99 and a 15--91 Singers plus I just thrifted a Wizard. It's blue and was made in Japan in the 1950's or 60's. I love using my vintage machines. Thanks for this fantastic give-away. I have a lovely Singer from 1948. I don't use it often but it runs great. I have a Household treadle that I use for piecing quilts. I also have a Standard treadle. I have a Japanese clone, a red & black Peerless that is converted to a hand crank for taking outside and when we go camping. I also have a newer Brother cs6000i used for quilting and piecing and everything else. Thanks for the chance to win! I have a featherweight, buy the bobbin case needs repair.